Feeling stuck? Everybody gets into a rut at one point or another. But the difference between the people who quickly recover and those who languish is their personal reserve of energy. While it would be great if everyone had the boundless battery of energy that that first group of people seem to naturally possess. There are still ways for the rest of us to unblock the nasty dilutions of energy that cause us to drag our feet, complain and generally feel bad. Maybe magnetic healing can help. Magnet healing can be used for anyone who struggles to keep that positive energy flowing at full capacity. Therefore it can help stall the negative effects of depression, fatigue, and other unpleasant feelings that can manifest as a result of poor energy flow. Magnetic healing has become more and more popular due to its effective results and clear instructions. One of the simplest ways in which you can gain the benefits of energy-channeling magnet healing would be a simple metallic bracelet. Such a seemingly minor object possesses a magnetic charge that complements the body’s own magnetic field. It should be in close proximity to one of the major energy pathways within the human body. 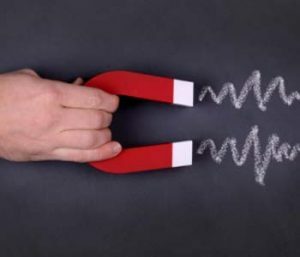 While you may encounter magnetic anklets that claim to yield benefits similar to a magnetic bracelet, the wrists are closer to more of the body’s various energy channels than the ankles. As has been previously addressed, magnetic healing interacts with the body’s bioelectric pathways. For instance this magnetic interference repels negative energy and accelerates the flow of positive energy. Beyond just the obvious notion of feeling more energetic, this sort of healing may improve your mood, your flexibility, and even your sense of self-worth. All these benefits are a consequence of the magnet’s ability to inhibit various unpleasant, negative energies. Energies like stress, fatigue, boredom, and irritability, all of which seem to be surging within the general public. So magnetic healing can ignite positive energies like hope, compassion, empathy, charity, and courage. Magnetic healing is a simple means by which anyone can gain a tangible grasp on their personal energies. This form of healing can aid you with all that your day entails. Help you live your life with more comfort and ease. Whether you are someone who is looking to stop feeling horrible and run-down by life. Or you are an upbeat person who wants to stay positive in life, consider magnetic healing as a possible solution. If you still feel a little stuck and are in need of additional guidance, please don’t hesitate to get in contact with us. We can help you overcome whatever spiritual or emotional obstacle is in your path.